You might also like these low carb bbq rib burgers. I have wanted to try short ribs for a long time now. I see them braised on cooking shows and they look sooo good. Well the other day I was in Giant Eagle and talking to the butcher. He told me that one of his friends buys a bunch of short ribs and smokes them. So I bought some and since it was a beautiful spring day I got my husband to smoke them. OMG they were out of this world! 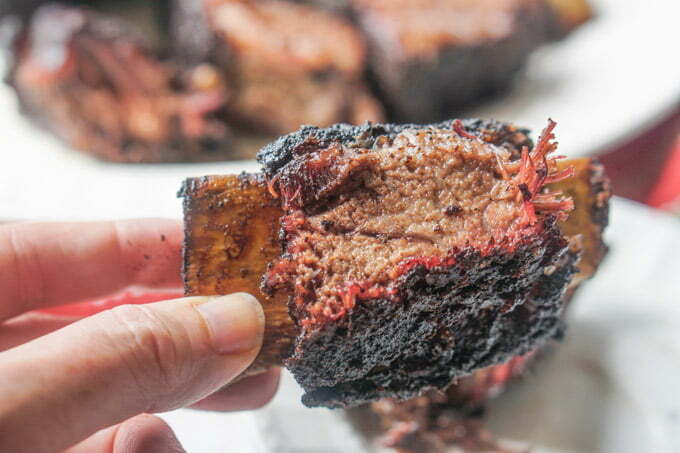 I can’t wait to make these bbq smoked short ribs again. What kind of meat is short ribs? 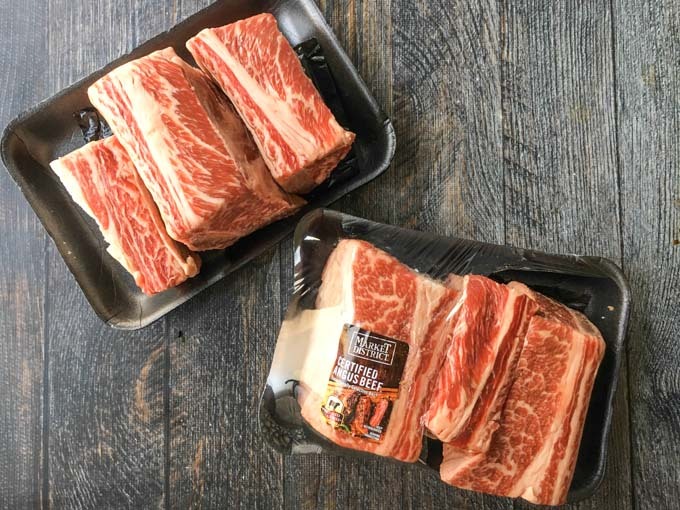 If you are like me, you might not know what is a beef short rib. It’s taken from the brisket, chuck or rib areas. They usually require long periods of cooking like braising to make the meat tender. They are also good barbecued. 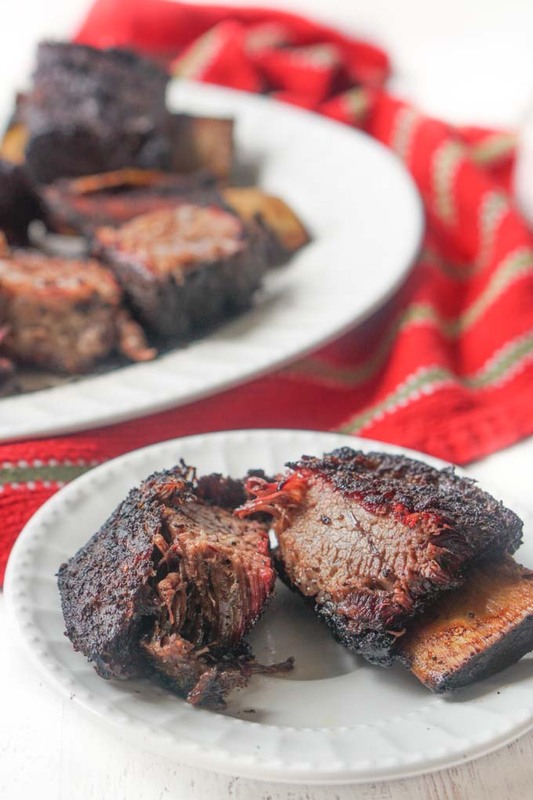 Click here to learn more about short ribs. Below you can see what the beef short ribs look like. I bought two packages of Certified Angus Beef ® brand because they looked so nice! 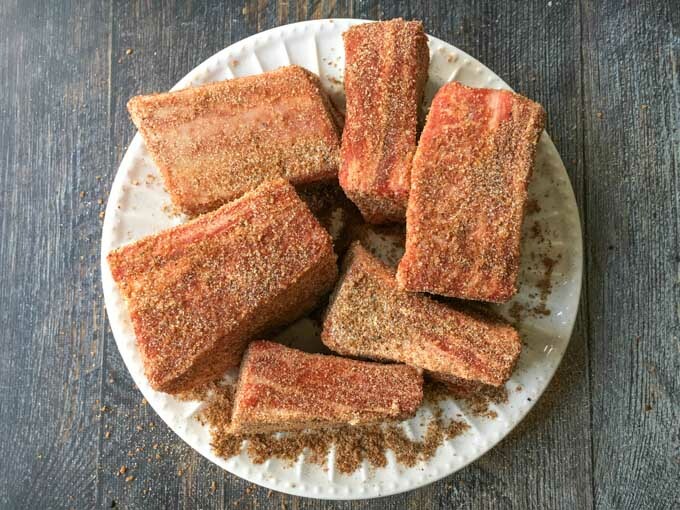 You can learn more about this cut of meat and find some recipes for short ribs on their website. They even have how-to videos. This was our first run with these ribs and plan on doing it often! We set the temperature to 270° F and cooked them for 3 hours until they are at 200 – 205 ° F internally. Ours were pretty dark because my hubby knows I like them like this. However if you want them less charred, cook them at 230°F for 2-3 hours. Below you can see what they look like in the smoker. 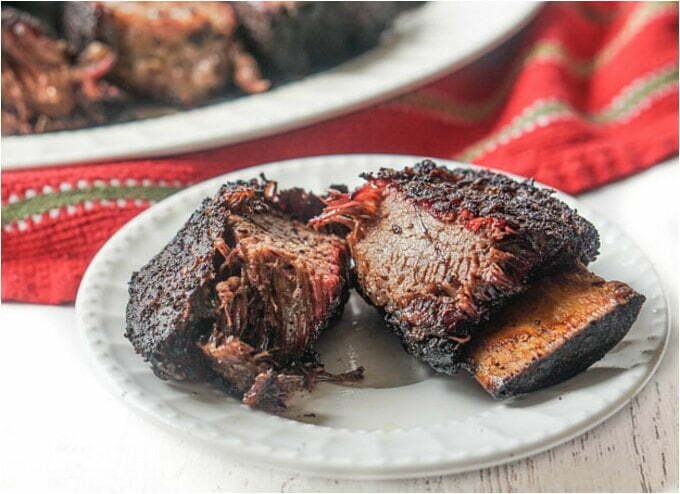 If you want to try this in the oven, rub the short ribs with the bbq seasoning and place in a baking dish. Cover with aluminum foil and bake for 3 hours in a 300 °F oven. Take off the foil for the last 1/2 hour. I’ve made a low carb bbq sauce for lots of my recipes. 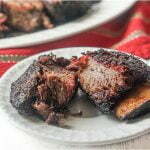 I didn’t think these bbq short ribs needed it but if you are interested you can make some. It will keep for quite a while in the refrigerator. 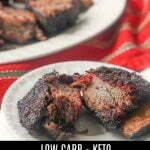 These bbq smoked short ribs are the best tasting ribs I have ever had and they are low carb! 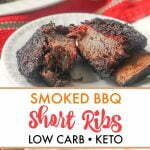 Each meaty rib has only 1.8g net carbs! Mix all the seasonings and then rub the mixture all over the ribs. 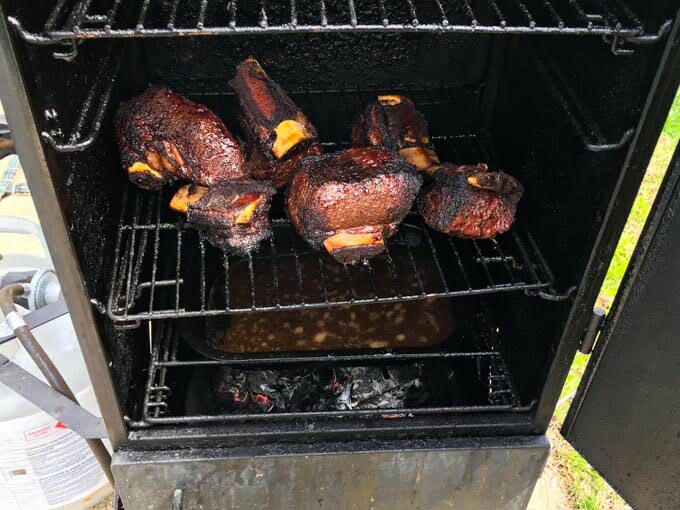 Heat the smoker up to 270°F and cook the ribs for about 3-4 hours until the internal temperature is 200 - 205°F. If you want them less browned use a 230°F smoker for 2-3 hours. I love short ribs. And I agree, the certified angus beef ribs are the way to go! I agree! This is my first time for short ribs and I am hooked! This sounds so flavorful and like a great dinner option. Love that you gave an oven option too so you don’t have to wait until the weather is warm to enjoy it. My husband is a huge carnivore so I’m pretty sure he’ll fall in love with me all over again after his first bite, lol! I have never tried making these but they just jumped to the top of the “to make” list! Wow! Great recipe for grilling this Spring and Summer. Hard to believe it’s even low carb. I remember wanting to make short ribs once and finding them in the UK was almost impossible!! I have no idea why they are not popular here, I did eventually find some and we adored them! Your recipe looks delicious and I love your spice mix, I’m a sucker for anything smoked so I know I would love these! I was just in England! We used to live there 10 years ago. On this last visit we ran around Tesco looking at all the things we used to like when we lived there. They look incredibly delicious! 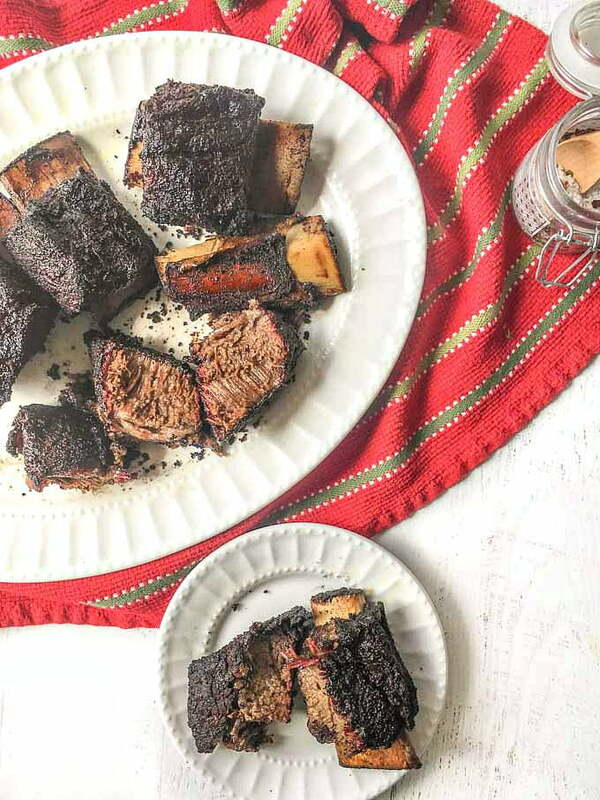 I have only made short ribs in a crock pot, but I want to try this recipe soon. I will let you know how they turn out!